Hello there everyone and a special greeting to the many Crash Bandicoot fans who frequent my blog. As I've mentioned previously my schedule and free time have been caught up with a lot of different things that pull me away from creative productivity lately. But I did have a chance this evening to punch out this 4 pose turn of Crash in the classic mode with some minor design variations. It was done as practice and also as a class demo on how to do a character rotation. Best regards to all and thanks for checking in. Hope you're doing well. Awesome as always, Charles! Ironic how you're doing another character rotation of Crash twenty years after the first one you did when you're working on the first game! Funny how things work, huh? 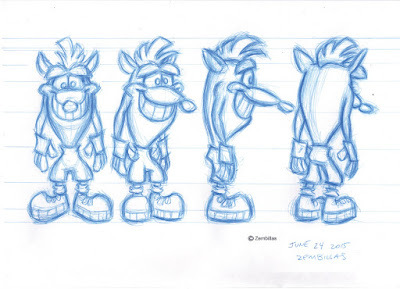 Also, Charles, I have a question concerning the Crash Bandicoot/Willy the Wombat pitch bible; when working on developing Crash's universe along with Joe Pearson, did you approach it as developing a pilot for a cartoon series and/or animated film, even though it was already envisioned as a video game? I've been meaning to ask this because in our Storypitch Class at SVA, our teacher told us stories how bibles work as springboards for potential projects such as cartoons and feature films (I did mine on an animated short, with a cat and a milktruck in a Tom & Jerry-esque fashion), he didn't mention video games though. I'd love to see you and Joe Pearson's work on the bible sometime in the future to see how it all works! Love this rotation! His posture and smile really portray his quirky personality! Great work. This has been discovered! Can you tell us about it?! Were you involved?! That video is a great find! 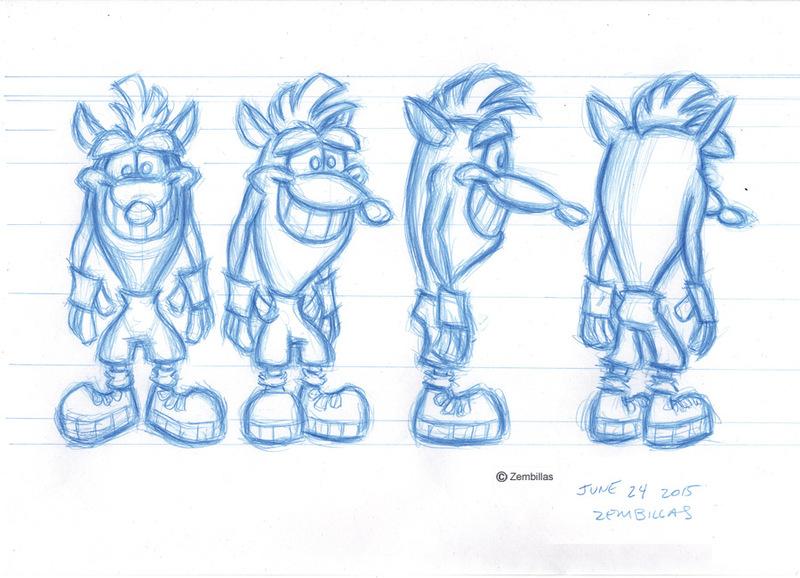 I wasn't involved with it other than the characters I worked on in the original development of Crash. This was a project that was done by Universal's cartoon studio in the early days of the franchise. They were thinking about a Saturday morning TV series for Crash. This was a test for the opening of the show. Joe Pearson did the storyboard I think. It was fun to watch it again. Thanks for posting! Pat I appreciate your patience with my reply. In the case of Crash we pretty much approached it from the angle of a TV series kind of thing but definitely in a video game context. It was still a new frontier back then and what we were doing was at the vanguard of character based games. The guys running things at ND and Universal had their ideas for what they wanted Willy/Crash to become. If I had a greater say in things or participated in how it developed after I played my part I'm confident Crash would have been even better. It was Rubin / Pearson setting the stage at the beginning. I operated in support of the direction they decided to go in creatively. A production bible is the manual for defining a project at its inception. Everything is then built off of the conceptual foundation that a production bible establishes. In the case of the Crash bible I'll figure something out. This is one of the best things that we discovered about Crash. I can definitely see your art style from the concept art all over this. I'm just imagining this with quality animation, like TMS Animation, the studio behind many Animaniacs episodes. One thing I noticed is that it's pretty accurate to the game story, something that other video games-based cartoons lacked, like the Super Mario or Sonic cartoons. Also: is that Komodo Joe behind the Cortex Vortex in the beginning? He looks really different, he doesn't look very similar to his brother either.